As the name suggests, this article, “I have RFI, now what– Locating it”, will show how I located several RFI sources in my area. This is part three of a three part series– Part one covered what tools I needed to locate RFI, while Part two covered internal removal of RFI sources within the shack, and finally, Part three covers how I located a number of RFI sources external to the shack, and how I got them corrected. A new section has been added to this site, showing the SDR based signatures of various RFI events, or look over the entire RFI series here. Over the past few years, I have been plagued with RFI on 40 and 80 Meters. Most of it has been Horticultural lighting, (read that as Grow Lights), and most of it has been pretty easily located. In fact most have been found in under 15 minutes! For the most part the folks I have contacted have all been decent types, and have all to a fault, done what it takes to either remove the RFI, or stop generating it. For that I am thankful to them, it saves me the time in getting the Federal Communications Commission, and the ARRL involved. It also saves the person generating the RFI, the problem of federal involvement. I suspect a lot of this “good luck” has been because I never threaten, or wave the Federal Communications Commission at anyone. I simply tell them, in writing, what I will do to get the RFI to stop, by giving them a handout our club created, which approaches the entire issue in a kind, friendly manner. The goal is to solve the RFI problem at the lowest possible level, not just go straight to the Federal Communications Commission, but to give the person a chance to solve the issue locally, so I don’t have to involve the Federal Communications Commission. Still looking, for source, someplace in the XXth, and REDACTED area. Still looking, began assisting REDACTED tracking a different RFI source, in the same area. The RFI starts at 9:59 PM PDST, each night, running throughout the night, and into and across next day until 3:59 PM PDST, at which time it ends. This cycle appears to be repeating each day. Did more drive around location, in the XXst, and REDACTED area, using mobile radio on 7 MHz., and 122 MHz., AM receiver in auto. Based on the timing of this signal, on at 10 PM, off the next day at 4 PM, I assumed it was a power company issue, so I requested power company involvement via email. in this possible RFI incident. 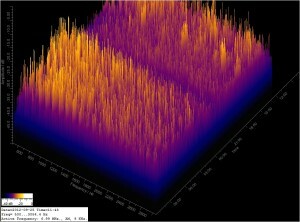 5 Khz., wide. Preamp off, Attenuator not in line. Yaesu FT-817 for all "on foot", operations using loop antenna. Attenuator not in line. Antenna used are described below. Gap vertical (Challenger), ground mounted. Gap Mono-band for 30 Meters, ground mounted. 3 Foot diameter Tuned Shielded Magnetic loop, known as an “Alex Loop”. Small handheld magnetic loop, approximately 1 foot in diameter. (Y axis), and time, (Z axis) over an arbitrarily defined time span. Amplitude is color coded to make reading simpler. When I do hear a new RFI source, the first thing I do is to start an entry in my RFI log, then I put my home radio on battery power and kill the power to my house by pulling the main breaker, after of course shutting down anything in the house that is a computer. If the signal stops, then I am lucky, I am the cause, and that means I can stop it simply, and quickly, without Federal Communications Commission involvement. As an aside, I also drop ferrite beads on every wire and cable I touch at home while doing the plug/unplug routine. As a result of adding ferrites, I now have almost no birdies across any band. To the left is an example of 40 meters. What you are seeing on the left, is the waterfall generated by my P3 Panadaptor, showing plus and minus 100 KHz., centered on 7.076. 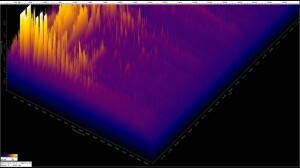 As can be seen, there are almost no birdies within the 200 KHz. segment shown at left, even though I am using two computers, a computer controlled amp, a switching power supply, and live in the middle of a city. Most of the birdies ended as soon as I started adding clamp on ferrite beads to every power lead for every device that might generate RFI. next day until 3:59 PM PDST, at which time it ends. This cycle appears to be repeating each day. and 122 MHz., AM receiver in auto. a power company issue, so I requested power company involvement via email. 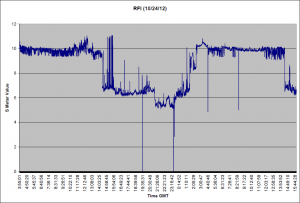 Began intermittent graphing of the RFI. See graphs, and FFTs. May not be power line related. Odd off and on times... Is on a timer  of some sort. Next I pick a frequency just below 40 Meters, 6.995 for example, and listen to it for a day and a night to make sure there are no Short Wave Broadcasters there. Once I locate a clear frequency, I start S-Meter Lite, and Spectrum Lab. See a review of S-Meter Lite here. S-Meter Lite captures the S-Meter levels, and times, allowing me to make a graph of my RFI vs, time, while Spectrum Lab captures and generates FFT fingerprints of the noise source. This allows me to make sure I am dealing with the same source over a long time period. This also tells me a lot… If the S-Meter Lite image looks like the image on the left, (about a day and a half), then I know I have something that is either on a timer, or is controlled by a solar cell, like a street lamp. If the start time is always the same minute and second, day after day, then it is a timer, if it changes slowly each day, then it is more than likely a street lamp following sunup.sundown light levels. Now that our city is switching to all LED street lamps, the entire Streetlight generated RFI issue will become moot soon enough. I worked with one of the city engineers prior to their installing thousands, of these lights. I know they are not an issue on 80-10 Meters, 2 or 440 for my mobile rigs at least, as I sat under each one of the test lights, and wrote down the RFI levels, then passed those results onto the city. The city was most helpful in taking input on this, and for that I am thankful! If I hear RFI at home, or someone has asked for help, I automatically start S-Meter Lite, and Spectrum Labs, or preferably, I have the the reporting person start them, and then run both software packages for about a month, while I do some on the ground direction finding, (DFing). This process gives me a really serious set of data points covering the RFI in question. This is very handy to pass off to the Federal Communications Commission, as it documents both the amount, and time-frame involved for the RFI, as well as getting a repeatable fingerprint of the RFI into the Federal Communications Commission’s hands. Thus allowing me to prove that the same source in the graphs, is the same source causing the RFI at my, (or the reporting persons), home. I always remember to jot down my actions in my RFI log as well. This might come in handy later if I contact the Federal Communications Commission, and/or the ARRL. Next I print out an overhead image from Google Maps of my neighborhood, showing about a one mile radius from my home. Google Maps allow you to adjust the display for True North, I always set the Google Maps display to show True North as pointing to the top of the screen before I print the map. I then find a North/South running road, and drive to it. Once there, I site my compass along that road. If the compass is adjustable, then I adjust it to show North, and South correctly. If not, then I note the offset and the direction of the offset. I now have all the information I need to plot the headings I get later when using directional antenna. Look to the left, and you will see a map I created, of my area. I then set a few points around the map basically covering the entire map. Next I write down the radio configuration into my RFI log, screwdriver turns count, if the attenuator is on or off, and where it was set, the band and frequency I am listening on, RF gain setting, and the S-Meter value I have on the RFI, while in my driveway in the mobile rig. This way, I can always check to be sure nothing has changed on my receiving setup. At some point later on, I pull out the RFI log, reconfigure the radio, and listen to the RFI again, it should be very close to the same signal level assuming nothing has changed. This allows me to normalize all of my data, so from run to run, I am able to compare the data and get meaningful results. I then drive to each point I selected on the map, pull out the Alex Loop, and note the heading, and the signal strength, of the RFI by listening for the weakest signal possible as I rotate the loop. 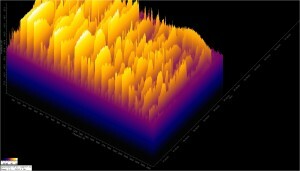 Why the null, or weakest signal, and not the peak? The null is a often times a lot more defined than the peak. A correctly constructed loop can give me a 20 db to 30 db null across a very narrow arc, while a peak is less defined, and not as deep. I always get a sharper bearing using the null method, so I always use loops if possible. I then take my sighting compass and sight down the line the null was on, and write down the bearing information. I always remember looking through the loop is looking through the null in the pattern. Looking at the loop edge on, is looking at the max, not the null, so I should always be able to just look straight through the loop and pick something on the horizon, (not close to you), that null in the pattern is pointing at. This gives me something to point my sighting compass at to get a bearing. Remember, I have already corrected for true, vs., magnetic north by sighting down the known North/South running street in the Google Map I used before I started, so I don’t have to worry about declination offset. All the while I leave S-meter Lite, and Spectrum Labs running at home. Both software packages are taking data while I am driving around taking Direction Finding, (DF), data. This process is ties the remote readings I get in the car, to the actual RFI I get at home. I do this in the event the Federal Communications Commission may want it, I believe it can be used to help prove that the RFI I am tracking, is the RFI I am hearing at home, or at the person’s house, that I am helping. Once I finish collecting the mobile S meter data, I go home, and plot it on the Google map. It will become obvious where the RFI is strongest, where most of the lines cross. Once I have that information, I take my 2 meter rig in the car, put it in AM mode, and then start driving the area indicated. Sooner than later I hear the RFI on both the 2 meter rig, and on the low band rig. Actually, when I drive around, I have the normal car AM radio on, tuned to a spot I can’t hear a station on, the two meter rig tuned to an aircraft frequency, in AM mode, and the low band rig in AM mode, and listening on 6.995 MHz. in AM mode That way, as I approach the RFI, I can tell how close I am getting… Most of the time, if it is not a horticultural light, I hear it on the car AM radio first, then the low band rig next, and finally on 2 meters as I get closer and closer. In rare instances, I need to move to 440 MHz., AM mode, to get in closer to the signal due to receiver overloading. This sequence does not have to happen this way, if it is a horticultural light, most of the time, I hear it on 40 meters first, then as I approach, the normal AM band, then 2 meters. I have an attenuator set I constructed, and use them on my hand held yagi, if I am on foot, but for the most part I will move upwards in frequency to reduce signal levels acceptable levels for Direction Finding. I keep the signal around S3 to S7 for DFing, if the signal level gets above S7, I either add attenuation, or move up in frequency, until it is again at S3, then I continue. This gets me very close to the source, probably less than 500 feet from it. At this point, I get out of the car, and proceed on foot, using the smaller shielded magnetic loop, or a three element yagi for two meters, and the FT-817, looking for the RFI. I use the highest frequency possible at all times. Most times, I will find the offending RFI source in short order. All the while, I am still allowing S-Meter Light, and Spectrum Lab to run at home, capturing both the S-Meter value over time, and a FFT of the RFI. As mentioned, this allows me to verify I am working with the same RFI source both at home, and in the field. I record the audio from the mobile rig, and the walk about rig. This allows me to play it back later, into Spectrum Lab, and see if it matches the original RFI I am hearing at home. Once I have a match, I know without a doubt I have the same source that is generating my RFI, or the RFI the person who asked me for help is hearing. Our club has a handout I give the person who answers the front door of the suspect building. It outlines the responsibilities of the people involved in RFI creation, and what steps I will be taking next if the problem continues. I offer to help locate the RFI, by telling the person when the RFI I hear stops– while I am OUTSIDE their home. I never go into someone’s home, period, I also never contact a person alone. I always have another amateur operator with me when I contact a home owner.. I suggest that they do a power off test, and I can triage that home off the map if it is not the cause, or I can work with them if it is. I use a pair of FRS radios so I can stay outside. I also never tell the person the RFI is gone, because it might not be, it might still be present on a frequency I am not checking, so I can only tell them what I know. This helps the person causing the RFI in locating the issue. I also suggest they might look into some of the newer filters made by Revolution, and Nanolux. I generally give the person about a month to correct the problem. If the person generating the RFI is working with me to fix the problem, I will spend all the time it takes, (within reason), to get it fixed. If things begin or turn belligerent, or no real forward progress is being made, I thank the person, and cease all contact with them and just turn over my RFI log, all recordings, and all data I have collected in the past month to the Federal Communications Commission and the ARRL for escalation. I may also send a copy of the Club Handout to the home owner if it is a rental. I always stress to the person involved, that the goal is to solve this at the lowest level possible, and avoid Federal Communications involvement. I have only one time had to refer my findings to the FCC/ARRL, out of about twenty RFI cases. My goal is to solve the RFI with the least possible intrusion into the other persons life as possible, all the while, trying to help the person solve the problem. I however have no problem at all getting the Federal Communications Commission/ARRL involved, and/or sending a copy of the handout to a landlord, if the person is not trying to correct the problem, as required by Federal law. I, always act professionally, and I don’t care what someone is doing that causes RFI, it is not my business, all I care about is that RFI is being generated, and it is interfering with my legal use of the spectrum, by my licensed station, and that it may be in violation of Federal law. I try and treat the person as I would like to be treated, I have found that this works far better than threats. Turns out there was a seven or eight strand cable, carrying around 5 KV, which had a few strands broken, they were arcing, and causing all sorts of RFI. I never touch a utility pole, why? 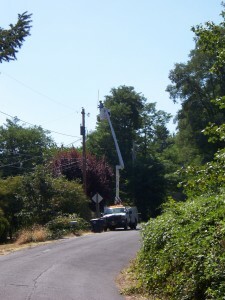 If the problem outlined above, had been worse, and I had shaken a guy wire, or in some way disturbed the pole, the strand might have fallen… Never a good thing to have a 5 KV line on the ground, so I NEVER ever touch a pole in any way. I was prepared to use the service the ARRL provides to help interface with the power company, but have never had to use that service here in my home town. 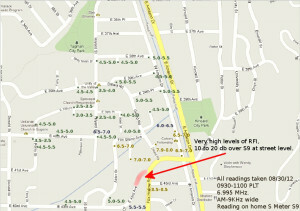 Initially two years ago I had a 20 db over S9 RFI level on 40 meters, 24 hours a day, seven days a week, 365 days a year. This had gone on for two years prior. Another nearby amateur operator had a 40 over S9 signal, on 80 through 10 Meters, 24 hours a day, for that same two year period, and a third amateur operator was unable to use 40 meters at all… All from a single source, that took two years to correct. Over the past three years, I have located six sources in my area, (and maybe another fifteen or sixteen other sources for other amateur operators), my background noise level is now S4 to S5. I have 40 meters back, and the amateur operator who had lost all of his entire HF spectrum, can now operate again. But it takes time, nothing about getting RFI fixed happens quickly, so get settled in for the long game. However it is well worth the results, look at the FFT on the left, now, look at the one at the start of this post, they are two years apart… All the work has paid off.